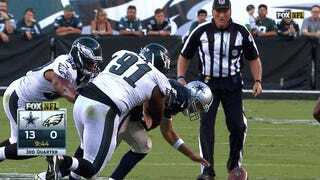 Tony Romo broke his left collarbone today when Eagles rookie linebacker Jordan Hicks sacked him and forced a fumble in the third quarter of today’s game in Philadelphia. This is the same collarbone that Romo broke in 2010 that caused him to miss eight games. He didn’t have surgery for that injury, and it’s currently unknown how severe this current break is. Brandon Weeden (he of the “God forbid I am forced to play” quote) took over for Romo. Thankfully for the Cowboys, the Eagles are playing very poorly. These first two weeks have been quite cruel to Dallas. They have already lost Dez Bryant for 10-12 weeks (or maybe less?) and starting guard Ronald Leary missed today’s game as well. Toss the starting QB on that pile and it’s gotten about as bad as it could, right? Oh, huh.